In front of my 'home' for 15 months, Epcot's Canada Pavilion Ever since my first visit to Disneyland Park in the spring of 1977, I have had Disney in my blood. Over one-dozen trips to Walt Disney World and 6 trips to Disneyland later, I still worship the mouse and all he stands for! My childhood dream was to work at Walt Disney World. 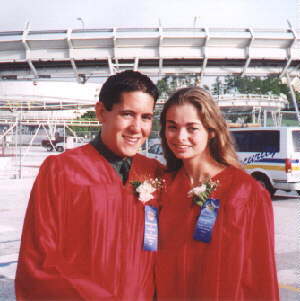 In the summer of 1997, I realized that dream. For 15 months, I was a server at Epcot's Canadian pavilion. I took the opportunity to visit the parks many times a week, participate in the grand opening telecasts at Disney's Animal Kingdom, watch Illuminations (practically) nightly, and so much more! It truly was the greatest experience of a lifetime, as you can imagine. It also gave me a great inside look at how the parks operate behind the scenes, and talk to the cast members responsible for all of the Disney magic. More importantly, I got the chance to work and live with a great group of people. Being Canadian, I could not stay past the 15 month duration of my work visa, I am now working on getting back to the Vacation Kingdom in a different role. With so many alumni on the Disney Cruise Line now, it seems logical that I have also applied to work on board. Once you've had a taste, you just can't stay away! While there, I also managed to meet my girlfriend of over a year, Kelly. I suppose that's the second greatest thing about being there (just kidding!). With my girlfriend, Kelly, and Test Track as a nice backdrop! On board the Disney Magic. My Disney interests mainly concern the theme parks. I have collections of old guide maps, books, and an obscene number of license tags, as well as newer cast-exclusive merchandise. I consider myself a true Disney trivia buff, and keep up to date on all the developments down in Florida, and throughout the company. 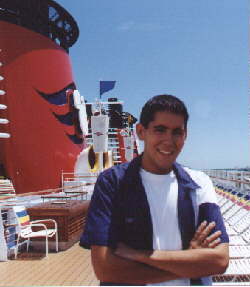 My future work with Disney begins Summer 1999 aboard the Disney Wonder, part of the Disney Cruise Lines. 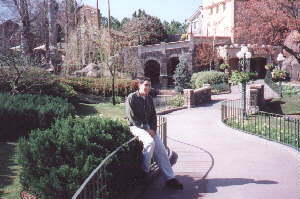 In between my years at Disney, I am finishing off my much-delayed degree in Political Science and Business Administration at Wilfrid Laurier University in Waterloo, Ontario. Have a Disney Day!